Turner Designs, along with scientists from around the world participated in a research cruise aboard the RV Meteor, a vessel owned by the Federal Republic of Germany through the Ministry of Research and Technology (BMFT) and funded by the German Research Foundation (DFG). The goal of this cruise was focused on ballast water sampling techniques and protocols. Various instruments were used to test collected ballast water enabling researchers to determine efficiency for the various sampling techniques employed. 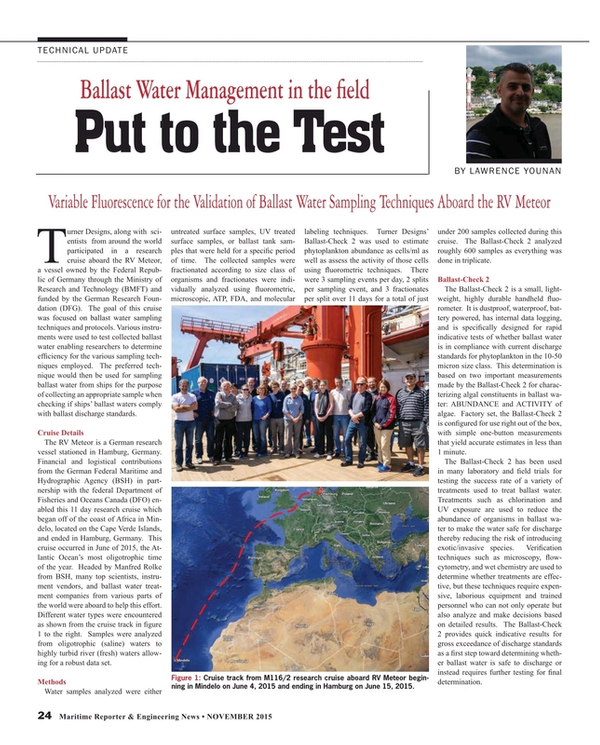 The preferred technique would then be used for sampling ballast water from ships for the purpose of collecting an appropriate sample when checking if ships’ ballast waters comply with ballast discharge standards. The RV Meteor is a German research vessel stationed in Hamburg, Germany. Financial and logistical contributions from the German Federal Maritime and Hydrographic Agency (BSH) in partnership with the federal Department of Fisheries and Oceans Canada (DFO) enabled this 11 day research cruise which began off of the coast of Africa in Mindelo, located on the Cape Verde Islands, and ended in Hamburg, Germany. This cruise occurred in June of 2015, the Atlantic Ocean’s most oligotrophic time of the year. Headed by Manfred Rolke from BSH, many top scientists, instrument vendors, and ballast water treatment companies from various parts of the world were aboard to help this effort. Different water types were encountered as shown from the cruise track in figure 1 to the right. Samples were analyzed from oligotrophic (saline) waters to highly turbid river (fresh) waters allowing for a robust data set. Water samples analyzed were either untreated surface samples, UV treated surface samples, or ballast tank samples that were held for a specific period of time. The collected samples were fractionated according to size class of organisms and fractionates were individually analyzed using fluorometric, microscopic, ATP, FDA, and molecular labeling techniques. Turner Designs’ Ballast-Check 2 was used to estimate phytoplankton abundance as cells/ml as well as assess the activity of those cells using fluorometric techniques. There were 3 sampling events per day, 2 splits per sampling event, and 3 fractionates per split over 11 days for a total of just under 200 samples collected during this cruise. The Ballast-Check 2 analyzed roughly 600 samples as everything was done in triplicate. The Ballast-Check 2 is a small, lightweight, highly durable handheld fluorometer. It is dustproof, waterproof, battery powered, has internal data logging, and is specifically designed for rapid indicative tests of whether ballast water is in compliance with current discharge standards for phytoplankton in the 10-50 micron size class. This determination is based on two important measurements made by the Ballast-Check 2 for characterizing algal constituents in ballast water: ABUNDANCE and ACTIVITY of algae. Factory set, the Ballast-Check 2 is configured for use right out of the box, with simple one-button measurements that yield accurate estimates in less than 1 minute. The Ballast-Check 2 has been used in many laboratory and field trials for testing the success rate of a variety of treatments used to treat ballast water. Treatments such as chlorination and UV exposure are used to reduce the abundance of organisms in ballast water to make the water safe for discharge thereby reducing the risk of introducing exotic/invasive species. Verification techniques such as microscopy, flow-cytometry, and wet chemistry are used to determine whether treatments are effective, but these techniques require expensive, laborious equipment and trained personnel who can not only operate but also analyze and make decisions based on detailed results. The Ballast-Check 2 provides quick indicative results for gross exceedance of discharge standards as a first step toward determining whether ballast water is safe to discharge or instead requires further testing for final determination. Throughout the cruise, the Ballast-Check 2 measured two parameters for each sample analyzed: Abundance and Activity. These parameters are used to indicate the amount of algae (Abundance = cells/ml) in the sample and how active the algae are with respect to photosynthetic efficiency. The total measuring time is short, < 1 minute, and the final determination of the “okay” or “not okay” to discharge is given by a RISK reporting. High risk indicates that there is a high abundance of algae in the sample and they are active, so if they are released into the environment there is a high chance of survival and proliferation. Low risk means algae in the sample are low in abundance or they aren’t able to survive and proliferate due to a diminished photosynthetic capacity. Although RISK wasn’t a parameter of interest for this scientific cruise, because numerical values were preferred for statistical comparisons, RISK was logged for each sample analyzed and the RISK determination accurately distinguished among samples that were and were not in compliance with discharge standards for all samples analyzed. A highly accurate determination of cells per milliliter in a sample is made using microscopic counts, but this work is extremely taxing, tedious, and requires specialized training to identify organisms of interest. The Ballast-Check 2 uses fluorescence responses to essentially estimate a count of the same organisms of interest as would be counted on a microscope. Figure 1 below shows microscope counts plotted against estimated Ballast-Check 2 counts for most of the samples analyzed on the RV Meteor. The counts from the Ballast-Check 2 and microscope show a good correlation (r2 = 0.82), considering the variability that exists with both counting methods. Figure 3 shows a good correlation between the Ballast-Check 2 and the Walz for a majority of the samples analyzed (r2 = 0.71), indicating the Ballast-Check 2 can accurately distinguish between active and non-active phytoplankton cells. The Ballast-Check 2, optimally configured for reporting Abundance and Activity of algae in ballast water per ballast water discharge standards, aided the efforts of this research by generating a robust data set to be used for comparing various ballast water sampling techniques. On a side note, Ballast-Check 2 results were compared with higher analytical techniques for characterization of algae in ballast water. With positive feedback and results from this research cruise, we conclude that the Ballast-Check 2 is a simple, easy to use instrument that provides all the information required to accurately determine whether ballast water grossly exceeds discharge standards. This low cost, rugged instrument is a great tool for quick indicative testing and compares well with other more expensive high end instrumentation. Turner Designs is very grateful to BSH and DFO for this opportunity to participate in their research cruise. We were fortunate to have been involved with this endeavor and have the chance to provide data from our analyses to help with this effort, while also having access to such a robust data set for comparison studies between our instrumentation and other analytical equipment. Lawrence Younan, Turner Designs’ Applications Scientist since 2006, has an academic background from Moss Landing Marine Laboratories focused on phytoplankton ecology and scientific instrumentation.